I am proud of my tree. it's blooms were beautiful this spring. I am amazed at the color this tree has when in full bloom. It is simply breath taking! Redbud Tree, aka genus Cercis, consists of clusters of small pinkish/purplish flowers that are on the old branches and stems before the appearance of leaves. Redbud Tree leaves come through in a heart-shaped or roundish form. They also are bronzy before they unfurl to a bright green to the transference of yellow color in the fall. However, the shade of yellow during the fall weather is inconsistent. And furthermore, redbud is any of a genus of 10 shrubs' species to small trees within the pea family. The pea family, aka Fabaceae, consists of southern Europe, North America, and Asia and are planted for early, spring flowers. The hardiest species are the eastern redbud, aka Cercis Canadensis. Redbud Tree come in new branch patterns, rosy and purple spring flowers, and a white, flowered variety. There US zones include MS, CS, and LS. This is the largest and fastest growing of the Redbuds. This plant is mainly able to take the tree form. It also comes round-headed with horizontally tiered branches. Leaves are three to six inches long with pointed tips, and the leaves are a vibrant green. Also, the flowers are small, measuring only 1/2 inch long. Other than that, this plant is colored lavender or rosy pink. 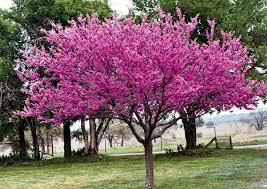 It's also referred to as the Judas tree. It is said that the betrayer of Christ, Judas Iscariot, hung himself from this type of tree. And as a result, the white flowers changed colors to red from the blood or shame. The Chinese redbud, aka C. chinensis, is mainly shrubby when cultivated. The following are instructions to follow in taking care of redbuds, depending on the species: Redbuds can be used in different landscape settings. They look great in groups, make beautiful lawn trees, are rightly placed in borders, and put attractively in foundation plantings. Redbuds are used nicely as small shade trees for courtyards and patios.